A few interesting changes have happened within Google Analytics in the past few weeks, and I’d like to write them down and explain it as clearly as I can for the online store owners and other people reading our blog. 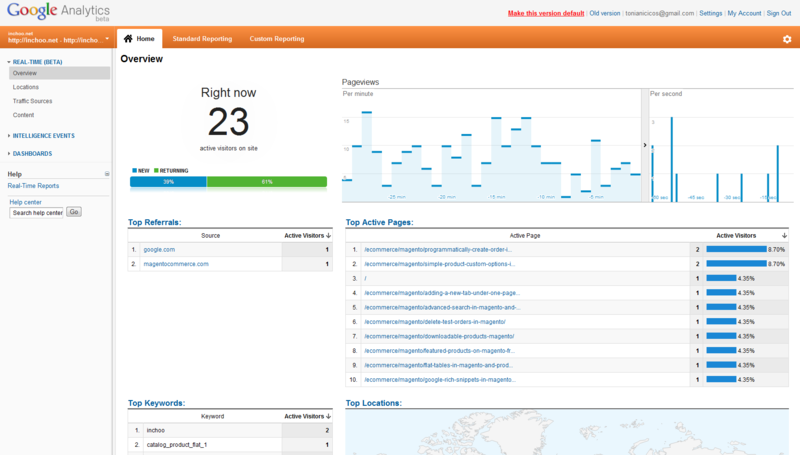 Some of you who requested to be included into the Real Time Google Analytics beta recently received an e-mail with the happy news that real time data reports are now showing in your accounts. We were among the lucky bunch. In order to see it, you need to switch to the new Google Analytics interface (the red link in the top right) if you haven’t so far. From what I can tell, real-time Analytics will be extremely useful whenever you’re starting a new campaign and promoting something aggressively, trying out which channel works best, or trying out which time of the day is the best for your marketing activities. You can get some nice data from it, and it really works real time, just like advertised. I tweeted a link and few seconds later, the traffic from t.co (twitter’s shortening service) went wild and perfectly corelated with the data of which URLs are being visited the most right now. Nop, this is not the data from a non-linked AdWords account, this is actually organic search data from logged-in users. Google decided to protect the privacy of their logged-in users, redirecting their search queries to https and not providing the keyword they used in the Google Analytics data. This is terrible for website owners since we get less data, but good for the user as the user’s privacy is even more protected right now. The problem is, data was anonymous anyways and such a “protection” was really unnecessary. Also, PPC campaigns still show data for keywords from logged-in users, which means only organic privacy is protected (Dear Google, WTF?). Only possible explanation that I can think of is that Google wants to protect the data of how they personalize the search results, meaning PPC ads are not personalized while organic results are. How much data is actually being protected this way? From the data I can gather, and data publicly available, only 1-2% of organic traffic will be shown as “(Not provided.)”. This means the number of users that are searching through Google while logged-in is really low. 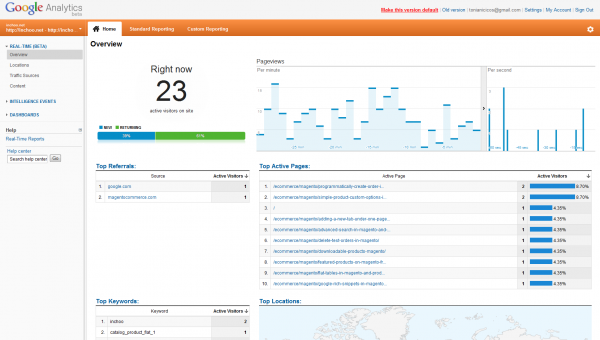 You probably noticed the new tab under the traffic sources in the new Analytics user interface. It’s called “Search Engine Optimization”. It can integrate with your Google Webmaster Tools account and data. The data you get from it is far from accurate and more of an approximation, but there are no “(Not provided. )” keywords for logged-in users in there (Again Google, why? Why not Zoidberg?). Some people ask why is the average position for some top keywords so low. The thing is, the way they calculate average position is kind of stupid, data actually seams much more accurate once you understand this. In case your website appears on more than one spot in the SERP, all will be counted and avarage will be made from it. Meaning, if inchoo.net’s pages appear on first 8 results for keyword “inchoo”, the avarage position is not 1st, but rather the avarage of all of these positions, around 4th place. very helpful article, i was searching for the same thing.Now i got cleared. From my understanding, PPC ads are not personalized. Just saying it would make sense to do so. I am just unsure of how seeing the keyword data for organic searches would really help determine how organic results are personalized. I just never saw any data showing that Google’s ads in the search network that you’re targeting via keywords are being personalized. It would bring better CTR but if you look at the official explanations of how the quality score is counted and how the bid auction system works, there is no clue that these ads are being personalized. If they were personalized, it would make no sense to protect the privacy of logged-in users who are clicking on organic results and not protect the same users if they’re clicking on paid search results. So it was only logical explanation I could reach. This really seems like quite a step backwards. It’s not entirely surprising though. Does the keyword info really give enough data to get an idea of how ads are personalized. What would be the reason for not personalizing ads? It seems that would be an obvious place to personalize since it should theoretically result in more PPC ad clicks. Not disagreeing with you, but curious as to your thought process leading to that statement. A good and to-the-point article. I would just say something about PPC campaigns. The point is that advertisers need to know the exact words which users entered in Google and then clicked on the ad. This data is relevant for optimazing your PPC campaign and/or for bidding (or if they produce very bad results – not bidding) on those keywords. Hence, that is why the main reason for which PPC campaigns still show data for keywords from logged-in users is because PPC urls are marked/tagged with the keyword data. Great article, I haven’t got any beta for realtime, looks nice. Regarding the no-keywords Google strategy I am totally disappointed. But, there are other features that are quite nice in new GA. I would like to see if there is some new hack to find a way round.